This is Idocracy meets Atlas Shrugged (novel) with a budget and it’s awesome. Neil Blomkamp’s follow up to District 9 mimics many of the same political themes and setups as in his directorial debut, but this time he treats his subjects with respect. Elysium is a hero of a blockbuster and as far as I can tell stands alone this summer as a movie worthy of the hype and expectation. Ely·si·um: the Abode of the Blessed after death in classical mythology according to Merriam-Webster’s dictionary. 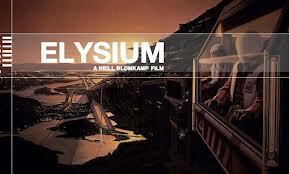 Blomkamp’s Elysium looks more like a vacation destination. Think Dubai in the sky, a massive space station with it’s own atmosphere of clean air and enormous reflecting pools. Apparently it’s where all of our bosses and their girlfriends get to live in the future. A residential paradise for the monetarily privileged. Meanwhile, back on earth where Elysium hovers above and in full site, but just out of reach of the huddled masses is where the story spends much of it’s time, in an unrecognizable Los Angeles to be more precise. Overpopulation, pollution, poverty and grime. It’s a future we’ve all seen countless times in films set in a dystopic future. This time it looks better (worse) than ever and despite a fairly clumsy sentimental heavy introduction of a young flashback version of our hero (played quit sufficiently per usual by Matt Damon) we care. Despite some fairly major shortcomings in the human interest dept. we still actively root for a very specific outcome. Not to the point of tears (I may have heard some sniveling behind me) but most definitely to the point necessary to have considerable interest invested in the characters. Unlike this summer’s earlier monstrous (pun intended) Pacific Rim release, this one can be taken seriously. This isn’t Saturday morning cartoons on the big screen, but instead a product of evolution whose origins can be found in past eras smart blockbusters such as Terminator and Aliens. Matt Damon does his thing and his thing works. Jodie Foster playing an unsympathetic Ayn Rand character is pitch perfect, while Sharlto Copley, who I’ve accused of being terribly miscast and in effect ruining District 9 for me, was cast as a ruffian to say the least and is a good bit of fun this time. Long story short, a ridiculous mother/daughter tandem that begged at our heart strings, an uninspired mano a mano combat sequence toward the end and a gaping plot hole and ideological misstep concerning the overall big picture (spoiler well below if you’re interested) cost Elysium one rating point in my mind. All that considered, that’s not too bad. The parts that worked and that is most of then parts, make those that don’t fairly forgivable. SHOULD WATCH in Imax if available. So the reason Elysium has to exist and the cause of suffering for all those poor souls living on top of one another on earth in the future is chalked up to the old overpopulation problem. If human overpopulation got us to this point to begin with, then what is the world going to look like after all the robot doctors finish their health care miracles that apparently allow humans to live forever. Just a couple droids of a different color and a the words “sterilizer” across their chest might have made this a perfect ending and a 5 star rating. Posted on Friday, August 9th, 2013 at 7:17 pm and is filed under Reviews.